New York is a city full of institutions big and small, high brow and low, famous and not. For my money, the qualities that make a New York institution special are independence, longevity, uniqueness and inclusiveness. A place where New Yorkers of all cultures, ethnicities, economic situations and styles intermingle. A nexus, or hub, that in some ways can be seen as a microcosm of the city itself. Not every institution in the series will be a business, but for the inaugural post, I decided to profile an establishment that for decades has brought together all types of New Yorkers, both as customers and employees. Hair cutting is one of those services that almost everyone needs on a regular basis. That fact alone endows the profession with the kind of universality and transcendence that I will seek to depict in this series. For decades, Astor Place Hairstylists, located on the skewed Astor Place in the NoHo neighborhood of Manhattan, has been efficiently and economically serving the hairstyle needs of New Yorkers needing a quick crop or an elaborate head design. I have had my hair cut at Astor Hair dozens of times over the past decade and have always been pleased with the no nonsense, get-er-done manner in which the barbers take to making me look good. Most of the hair cutters are immigrants, many of them settled in New York for decades, and have built comfortable lives for themselves with the consistent work and congenial atmosphere they have found at Astor Hair. My favorite visits are the ones when I am given to one of the several barbers from Italy, with whom I chit chat in my second language about life, food, America, missing Italy and of course, soccer. In this age of chain-everything, Astor Hairstylists remains resolutely independent, unique and human. 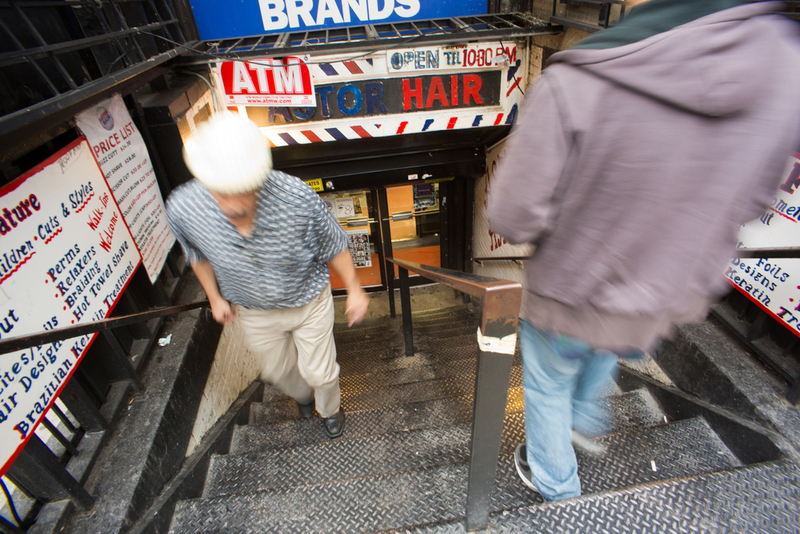 The somewhat unkempt premises - now restricted to the basement, but which once also occupied the store above - is a lively antidote to the scrubbed, and some would say soul-less, array of familiarity that has become the norm in New York City. Aside from a reliable high and tight haircut, another aspect of Astor Hairstylists that I appreciate is its classlessness. Like some other great New York institutitions (Central Park, The Metropolitan Museum and the Subway) Astor is place that welcomes New Yorkers of all social, economic and ethnic backgrounds: NYU students, bike-messengers, celebrities, musicians, businessmen and women, East Village punks (if there are any left), hipsters, and just about anyone else you can think of, everyone goes there. It's not a best kept secret, but getting chopped at Astor bodes well for those seeking "real New Yorker" status. I've tried other, hipper barbershops, but I keep coming back. It will be a shame when they finally close up shop, there's nowhere else like it. Fortunately, haircutting is a recession-proof profession. No matter what the stock market does, our hair keeps growing and growing. In a town where hardworking people shell out $2.50 to ride the subway and up to 50% of their income to rent a tiny apartment, at $16 a basic mens haircut is a fantastic deal! ... but that doesn't mean they don't know when to take a break! Thanks to all the staff at Astor Hairstylists for allowing me to take pictures!